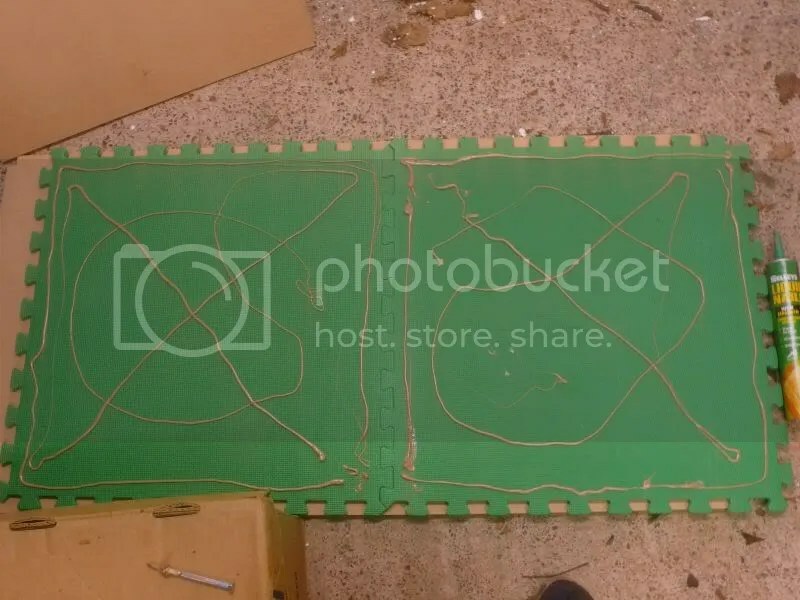 WIP – gluing the boards onto the foam. I use a Selleys “No More Nails” which seems pretty strong and easy to use, and I let it cure for the full 24hours for each board. I stack the rest of the boards ontop and a few boxes of wargaming figures to weigh it down while the glue sets. SO far I’ve only had one board slide a bit while the glue was setting, so I will have to trim the edges with a hand saw. The Joins. I had to leave a reasonable gap between each board otherwise the foam “teeth” catch on the wood of the other board when you push them together. I found this out the hard way after I cut all the pieces and glued the first couple to the foam and the foam wouldn’t interlock. So I had to go back and cut 20mm off 2 sides of each of the wooden boards… The only good thing is I can use the offcuts for the table edge pieces. BTW all my flock from Angel Barracks has turned up and it looks very good. I’m going to start a test with the paint and flock on one of the boards. Hopefully the paint will cover the green and black evenly. Another update as I figure out how I will layout my towns. I’m trying to get away from the traditional square shaped towns but still have something that is flexible. Hexagons seems to fit together well and it is easier to run roads at different angles. I can also use blank sections to make the towns smaller or use the individual pieces as smaller towns. I created some 1:1 cardboard templates I am using to map out my towns. The rules I use for moderns have a restriction of 300x300mm for any town so the furthest distance of any two points of the hex is 300mm. I will make enough for 4 towns with 2 of each layout and some extra bits in the future. I am also planning to use the same shapes for my forests so I could mix town and forest sections together. Lots more options are possible but this gives you an idea. I can make bigger or smaller towns depending how I match the pieces so it will hopefully be flexible. I will use 2mm plasticard for the town bases as it is nice and strong and doesn’t warp. I’ll probably bevel some of the edges as 2mm is quite thick. Back with a new project – 6mm terrain boards! Over the last year or so i’ve been amassing ideas, bits and pieces to begin work on a set of 6mm terrain boards. These will be used for mostly 20th century gaming but I’d like to use the for napoleonic and ever earlier if possible (this will depend on the road colour mostly). The main motivation (if I needed any) is a modern tournament here in Auckland in Feburary. 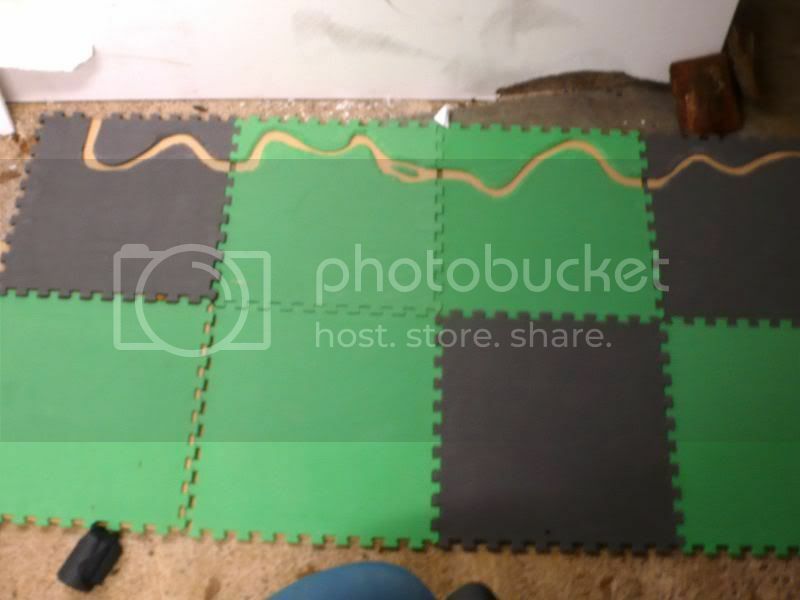 I want to have enough tiles done to cover a 8x6ft table and maybe more. 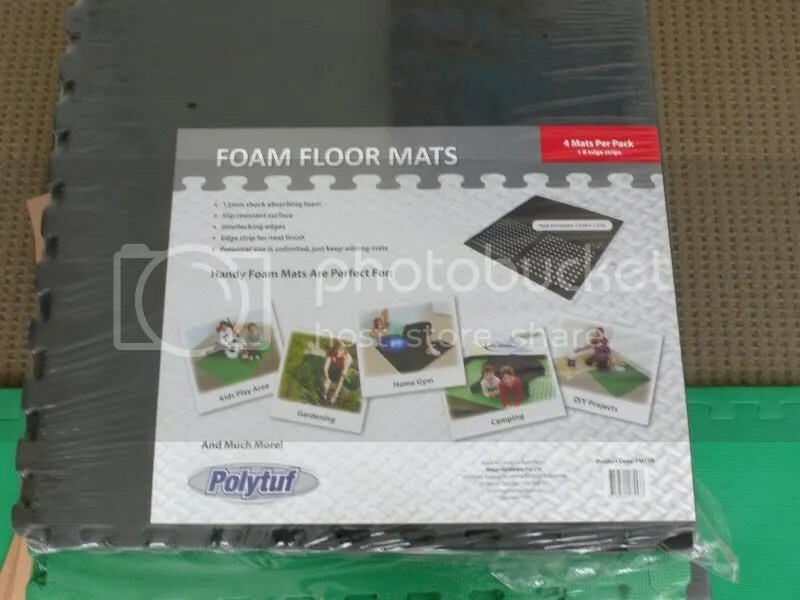 I’m going to use 2x2ft interlocking foam tiles (which are used as kids play mats) and I’ll mount the on 4.75mm MDF. 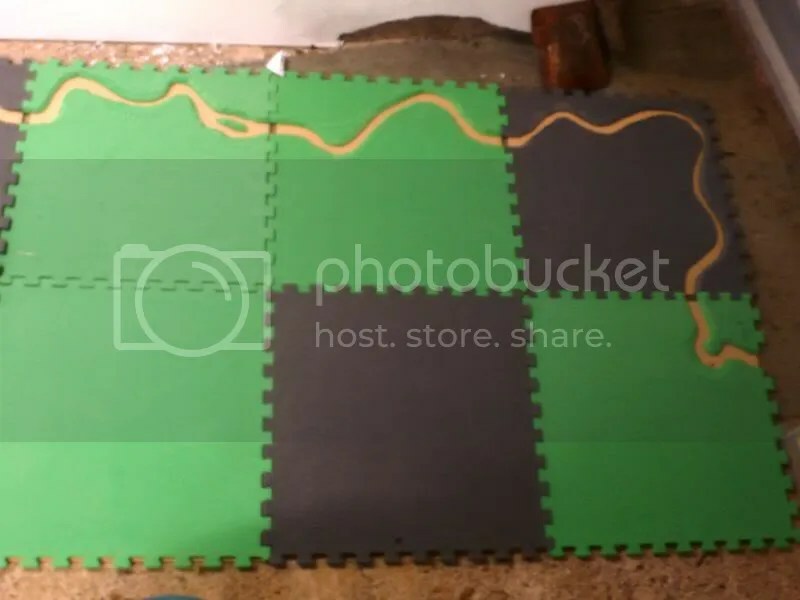 I will make hex shaped areas on my boards plain (no flock) so that I can add removeable terrain features like towns, forest, woods, fields etc. and I will also make plain areas (flocked but no details) where I can add farms, small villages and other smaller items. Some terrain will be fixed including hills, rivers, roads, streams, ponds and a coast line. Some of the other pieces like hills will have a clear area on the top, where I can add features like a cell phone tower, wind turbine, stone circles, temples, monastries and windmils. 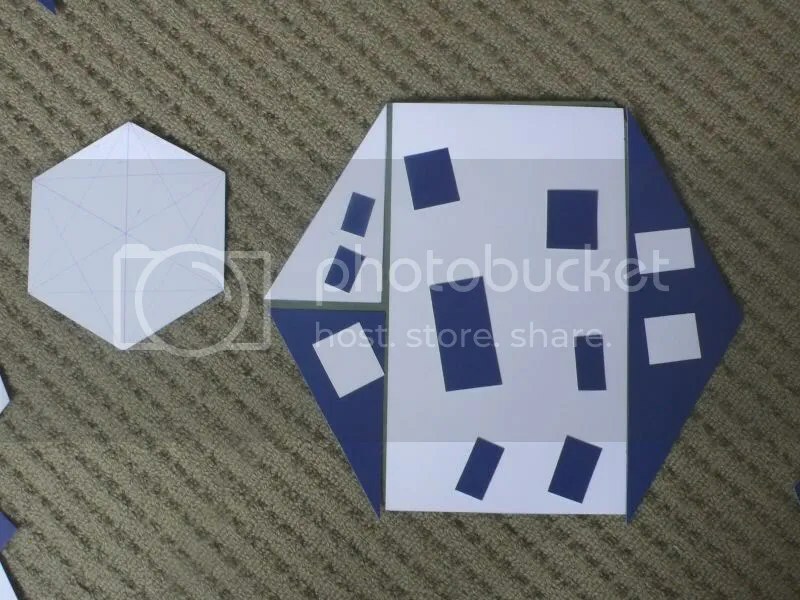 I’m planning to make some new towns for the terrain boards and these will be no larger than 300x300mm and a hex shape (this seems to be the most flexible for joining road and I can rotate pieces. There will be 1 main section per town with 2 – 5 smaller pieces and I can use the pieces as smaller towns if required. 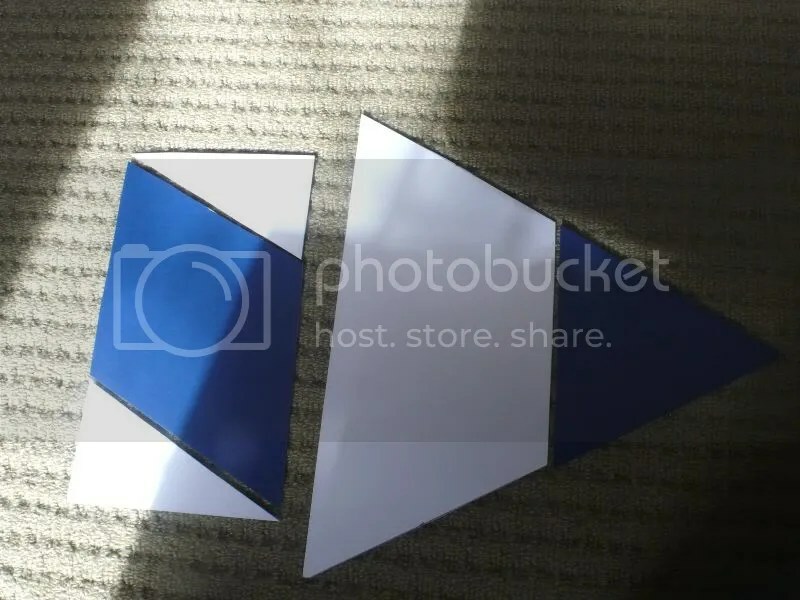 I will have about 6 different shapes but they should fit together pretty well as a hexagon can be divided up easily. 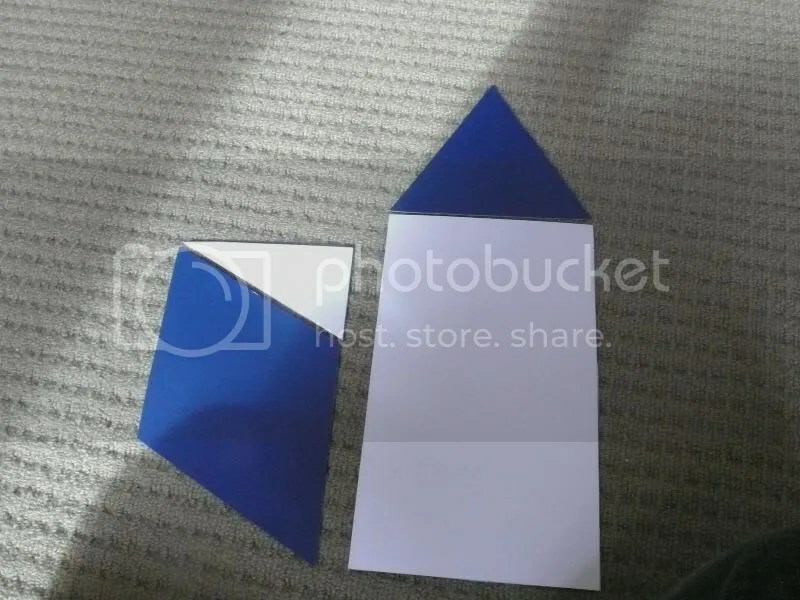 I’ll post some pictures of the template I have to give you an idea of what I mean. The terrain pieces to go in these wont necessarily fill the whole area so I will have filler bases (eg fields, parks). Also there will be roads which will enter all in the same place for each blank area. This lets me create cool things like ditches next to roads, sunken terrain, good looking water ways, gullys, folds and so on. I’ll also have individual trees (with pins in the trunks) which i can stab into the terrain and can put them anywhere (I might try and do this for power poles, lampposts etc. I have a few buildings painted already and I’m finishing off my airfield buildings (there will be a small airfield on one of the tiles). Most of my large towns wll be paper buildings but I will still use a few resin and scratchbuilt ones and i’ll mount what I have already finished on the new bases to save time. Thats all for now. I’ll post some pictures of some of the materials and town sectors plans I used probably tomorrow. And I’ll keep updating this thread with progress. This blog is a slight diversion from my sculpting of 6mm (1/300th) terrain. I’ve been thinking about ways to paint/model canopies since a discussion with my air gaming buddies the other week and I still haven’t found a painting technique that I like that much. Plunge mold (similar to vacuum moulding but without the vacuum) the canopy using an old blister pack and a candle. Most people came to the conclusion that I am mad and they are probably right. I also have enough other projects to do without getting diverted onto a another time consuming project such as this. First I tried using some old blisters to push mould the canopy onto a Me 262 2 seater from CNC. This is a nice model with good definition on the canopy, but after numerous attempts this is the final result. Obviously its hard to see much in the photo so I tried a blue ink wash but that didn’t show up the results any better. You can just make out the ridges on the top of the cockpit butthe side detail isn’t very good. From what I could tell the results weren’t great so I thought I would try using this as a mold and make a canopy from PVA. I didnt want to spend $50 NZ on some clear resin as this is only an experiment at the moment. After a few days of drying the PVA mold didn’t come out very well as it shrunk a lot during the drying. I should have added some more PVA into the mold, but I forgot at the time, but I will. Next I will try to sculpt a couple of WW2 pilots and make a vacuum forming box. The 1/300th vehicles have taken a back seat to the scenery since it is easier to mold and cast in resin. For any metal figures/vehicles, we need to find a local person/company that can cast metal figures, and the options are limited. Most wargames trees come with twisted wire trunks which look ok from a distance but stll look like twisted wire trunks. I came up with the idea of making trunks after seeing the lovely larger scale tree trunks by Snapdragon. I started by finding some small brass tube offcuts, and checking that a few different brands of twisted wire trees can fit inside them. Then I made a base area out of a blob of green stuff and pressed the brass tube into it. Once that had hardened, I made the trunk out of modelling putty. I wanted to make them big enough to stand up to the casting process but not too overscaled. The details on the trunks are quite exaggerated but hopefully that means that they will paint up well. Once they are finished it should just be a matter of trimming the trunk of your tree and glueing them into the trunk. Another option is to fill the hole to make a tree stump, or add a few twigs/ pieces of wire to make damaged trees. They are pretty simple and are easy to make yourself, but if you are like me and have hundreds of trees then it could become very time consuming. So these are aimed at the gamer who doesn’t have the time or inclination. Next up will be some African buildings. I have also been experimenting with different methods to make African shanty buildings. 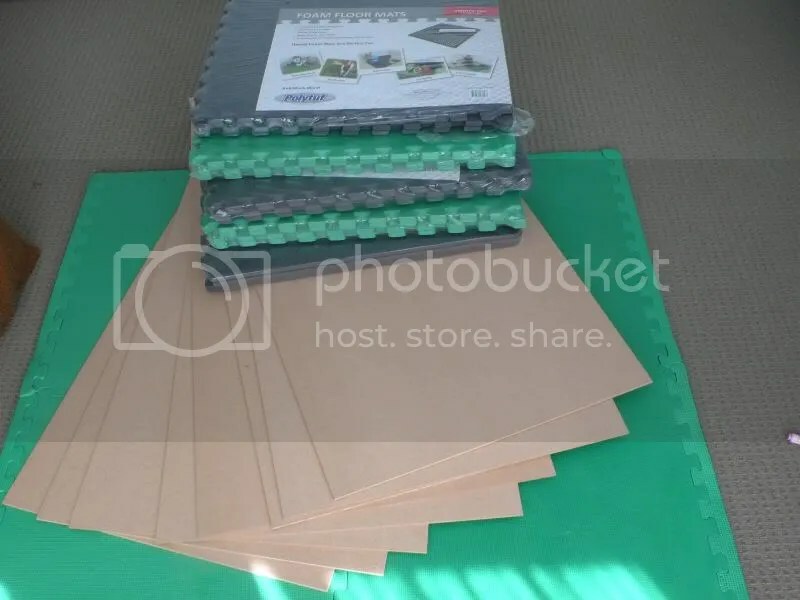 I have some good templates for making windows and corrugated iron and I will try and include those in the next posting. iron and I will try and include those in the next posting. After a bit of a break while I worked on other things I’m back into it. My hole punch tool arrived and it looks very useful. The punches are hollow so if the pieces get stuck in it you can push them out easily. I might invest in a better hammer as I only have a claw hammer and I think its overkill for punching through 0.5mm plastic card! I gave it a go on some 0.5mm plasticard and here’s the results. I tried it on the cutting board but its too soft and it allowed the plastic to flex and it didn’t cut well. Later on I tried it on a piece of wood and the results were much better. First I finished off the garden sets but I am still making a fountain to go with it. I might make the fountain part separate as it would be easier to cast I suspect. Next I started on some tiled stone walls. These will be useful for European scenery and are generic enough to be useful for other periods. I made some 60mm long sections and the corner sections are 15mmm long in each direction. I laminated two pieces of plasticard together so that I could cut holes and have brick plastic card showing through. The door was scored into the plastic (I softened it by putting a small dab of plastic glue onto it first) and I added some tiles around it from 0.25mm plasticard. 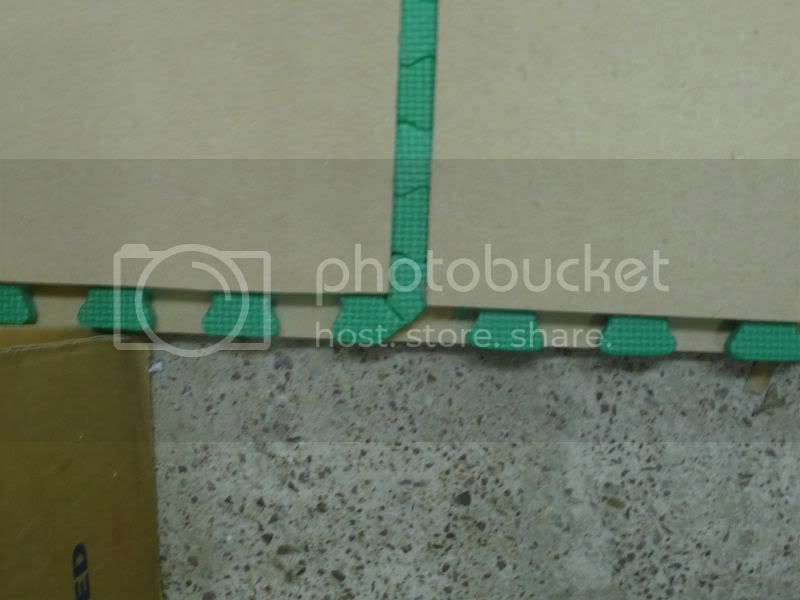 I also added tiles onto the corner sections but they are very hard to see in the photo. Then I added some small wall supports and covered the walls with a thin layer of modelling putty to create a slight texture. After that I put a thin strip of modelling putty along the top and once it had hardened slightly I sculpted the tiles onto it with a modelling knife. Finally I textured the base with modelling putty and made a couple of small bushes to break up the wall sections a bit. I plan to make a bigger gate and a damaged section of the wall to go with these and tidy these up a little bit more. Next blog I’ll hopefully finish off the other walls sections and I have a good idea for 6mm trees to try out. Well I’ve just spent the last week and a half painting a army for the NZ Flames of War Mid war GT. Now I can get back into some 6mm scale stuff again. In the last blog I didnt have a lot of success cutting the wheels out of plastic card so I decided to try stamping them out of putty. The plan was to use Procreate to make the mold and the wheel. I’m also waiting for a hobby hole punch to turn up so I thought i’d try this out first. I got some of the plastic wheels I had lying around and glued them onto pieces of sprue so that they could be easily stamped into the putty mold. I assembled some tubes of brass, a needle and a dremel bit. One handy tool that I had was a round bladed tip from a dremel type tool. I had a Fuller dremel style machine that came with one but some how I lost the bit so I had to buy another. It is very useful for making spoke or wire wheels. I pressed the various tools into the putty along with brass tubes to create the wheels. I stuck the putty onto some scrap plasticard to give it some rigidity. I removed the strips around each one later on, as they got in the way when I was pressing the putty for wheels onto them. I am pretty happy with the result even though they are a bit irregular and they still need trimming and cleaning up. The detail is good considering the size, and the wheel nuts (made from poking the needle into the mold) on the larger truck wheels are visible. Also the spoked wheels can be seen in the 2 middle wheels on the right side of the picture. I figure that if I make enough wheels, then I can use the best ones for the masters. I thought I’d start with something simple so I am making some gardens for a chateau or as a town square/garden. The basic shape was made from plasticard and the I added some foliage out of putty. 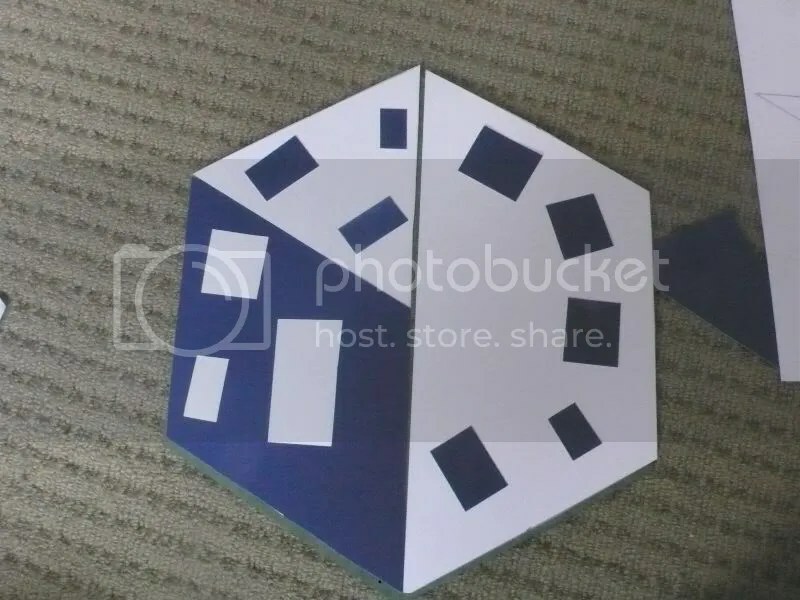 This is half a “set” as I will sell 2 retangular shapes, 2 square shapes , 4 triangular shapes and 4 curved shapes in a set along with a statue or fountain. They should be a good addition to any town square or the garden of a chateau/manor. Whilst these would be easy to make yourself, I’m aiming this at the gamer who cant be arsed/doesn’t have the time to make these themselves. After some good ideas from the 6mm yahoo group I had a futile at making car and truck wheels. In my previous attempts, I had used green stuff but I found it hard to get the shape and thickness consistent. So I decided to try cutting them out of 1mm thick plastic card. My idea was to get some brass tubes, file the edges and use them in a drill or dremel to cut circles. I made 3 different sizes – truck, van/suv, and car. I put tubes within tubes to scribe the inner parts of the wheels and put the in my electic drill. Some of them came out well, but I found the brass tube didnt cut through plasticard very well. So I tried the dremel but the high speed melted my plasticard into the brass tube (see the white plastic inside the brass bits in the picture above)! Some of these that survived have a nice raised area in the middle where the melted plastic gathered. So I went back to the drill with my now clogged cutters. I also tried making some new tubes just for cutting the outside edges but that didnt really work either. In the end I got about 30 large wheels and a few medium and no small wheels as the cutter just didnt work well enough. Some of the wheels that I produced. The pictures show a few of the wheels I got out of it and none of these I was very happy with, and I spent most of an afternoon on it. Later on I remembered I had some small return roller wheels from a 1/72 Marder and Leopard 2. They are nicely detailed and will make great rims for the wheels. I also remembered some 1/288 aircraft wheels I had from a Tu-160 Blackjack and a DC10. 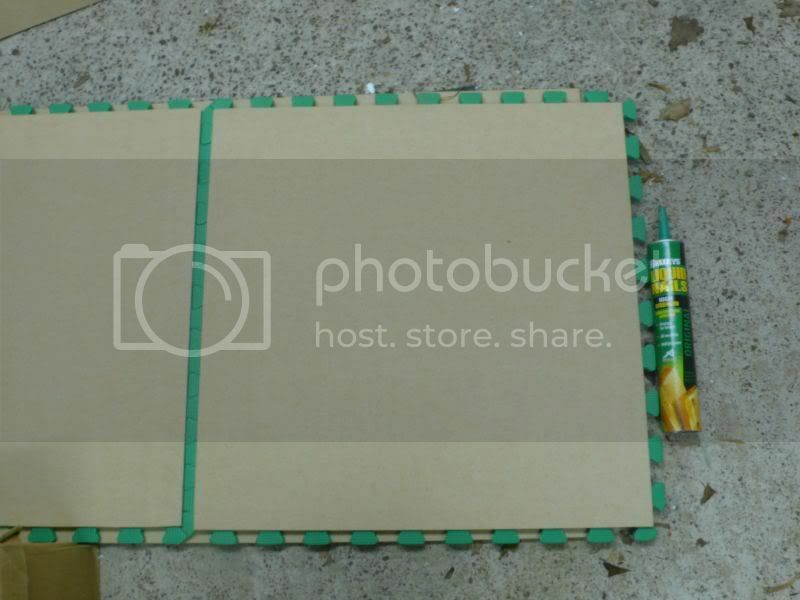 They are a little big but can be filed down and they will well for large 18 wheeler trucks. Now I’m off to try this and I will post the results in the next blog. Meanwhile after speaking to my mate who is going to sculpt some 6mm figures, he recommended making some scuplting tools as the standard ones are too big for making 6mm figures and terrain. I had some dowel lying around and some old knife blades and needles. For the first tool I just bent a needle. The second tool was a knife blade that I rounded off but I think it still needs to be shaped better, and the third tool was a needle which I flattened and then rounded the end to make it nice and smooth. Then I sanded down the end of the dowel and drilled a hole for the needles to fit in. Next I glued on the needles into the hole with superglue. For the knife blade I cut a groove using a small modelling saw. Finally I added a few layers of PVA where the needle/blade went into the dowell to help give it more strength and to prevent it moving around and coming loose. The idea of this blog started when a friend and I decided to start making our own figures in 6mm scale. There are quite a few gaps in the ranges available and quite a difference in quailty between the different manufatcurers. Whilst I’m not a fan of blogs I thought it would be good to document to some of the ups and downs of creating figures and scenery. I already had a few ideas about 6mm models that I wanted to create and these includes civilian vehicles, modern African soldiers and mercs, civilians and some vehicle crews. My friend would sculpt the figures and i would try making some terrain masters.